The Senate and the House of Representatives have passed a landmark plan to avoid the dreaded “fiscal cliff” that loomed up with the new year. Brokered in the 11th hour by Vice President Joe Biden and Senate Minority Leader Mitch McConnell, the deal allows Bush-era tax cuts on those earning over $450k to expire, while putting-off spending cuts until later in 2013. The deal is widely seen as a huge win for President Barack Obama. When it became apparent that any deal would involve raising taxes House Speaker John Boehner stepped back as if he were facing a snake and insisted that Senate Majority Leader Harry Reid would have to take-up the negotiations. 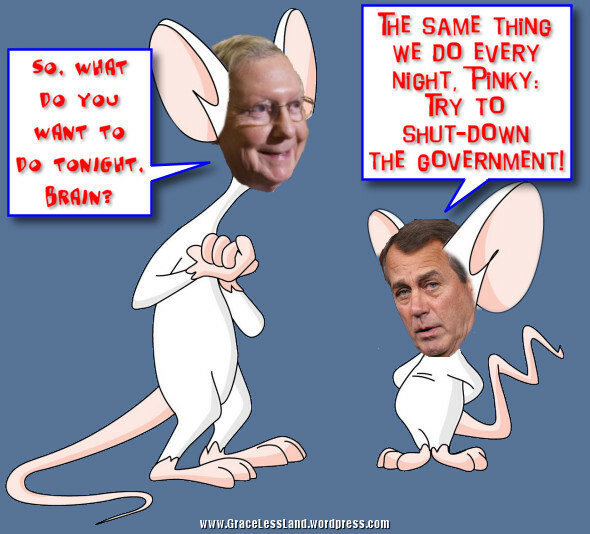 When it became apparent that any deal would include spending cuts Reid ran and hid like a frightened child. That left McConnell, who is being sacrificed to the wrath of conservatives, and Biden, who really has nothing to lose at this point. Senate Minority Leader Mitch McConnell thought he would lure Democrats into a trap that would make them lose a key vote on Thursday, but as it turned out Senate Majority Leader Harry Reid had set a little trap of his own. A candid exchange between President Obama and congressional leaders Cantor, Boehner, and McConnell at the Washington debt summit meeting. Oh, no – you won’t catch Mitch McConnell out that easily! Moments after this attempted trickery the President left the room in a huff.